The latest member of the Squeezebox family of digital music players refines some of the features of previous models, such as the Squeezebox Classic, while adding many new ones. The most obvious difference is its bright, 4.3"-wide touchscreen, but this amazing little box has a lot more to offer. Still, its design is unprepossessing for an audiophile product -- it’s almost entirely plastic, and looks more like something that a store would display with the clock radios instead of with the audio gear. In fact, one review I read found fault with it for costing $299.99 USD -- a very high price for a clock radio, that writer thought. The Touch is not a clock radio. It’s an audiophile streaming device capable of handling 24-bit/96kHz music files that also happens to include clock-radio functions among its many extras -- so many extras that, rather than being too expensive, it’s a bargain. The Logitech Touch measures almost 6”W x 3.57”H x 3.18”D, with a screen 4.3”W x 2.2”H. The front is smooth, with no controls or ports, its sleek, shiny surface decorated only with a discreet Logitech logo. The touchscreen and case are tilted back about 30° from vertical (the angle can’t be adjusted). On the back are a headphone socket, a pair of analog RCA outputs, optical and coaxial digital outputs, an Ethernet port, and a USB output for attaching an external hard drive. The headphone output can be used for external powered speakers if you’re connecting the Touch to an external drive and using the Touch’s own internal server, the Tiny SBS. (Smoothing out the Tiny SBS functions was one of the main reasons the Touch was released five months after its initial street date.) On one side is a nearly invisible slot for inserting an SD card. Since music releases on SD cards seem more in music’s future than its present (Cardas has put out a few, and there are rumors of others), this seems a feature that for now will be used mostly by photographers. The Touch’s digital-to-analog converter is an AKM Semiconductor AK4420 stereo chip. The Touch produces 2V RMS output on the RCA outputs. The Touch is claimed to be bit-perfect to 24/96 and will play these file formats: FLAC, AIFF, WAV, Apple Lossless, WMA Standard, MP3, AAC/HE-AACv2, and HD-ACC. Also included is a power cord incorporating a transformer to be plugged into the wall, an infrared remote control, two AA batteries, RCA stereo analog connection cables, a cloth for wiping the screen (Logitech cautions against using anything abrasive), and an instruction book. One of Logitech’s greatness weaknesses over the years has been a lack of printed instructions, so I approached this 156-page volume with great hope -- only to find that its heft was the result of its ten pages of very basic information in English being duplicated in 12 other languages. There is another manual, Getting to Know Logitech Touch WiFi Music Player; you can find, read, and download it here. The presence of the Touch’s internal server, the Tiny SBS, means that one could simply connect the Touch to an external drive containing music files and plug a pair of powered speakers into the Touch’s headphone jack. The typical user, however, will probably want to use the Touch to stream music stored on a computer to a main audio/video system. To do this, you must download to your computer Logitech’s free Squeeze Center software; the Touch can then be configured to work with either a wireless router, or hardwired with an Ethernet connection. You select Wired or Wireless operation during the setup, an incredibly simple process. For the most part the Touch worked well wirelessly, though the sound dropped out once in a while, which might not have happened had my computer and audio system not been 30’ and several walls apart. Hardwiring them together with a 50’ Ethernet cable solved the problem. The Touch did most of the searching for networks and addresses, but should you have a problem with this, you can call a toll-free number: (877) 887-8889. Logitech’s Squeezebox help line is possibly the best in the industry -- as complete and detailed as its printed manuals are incomplete and general. I found that the technicians really did try to help me. Most of my inquiries were solved at Level One, but if your problem is thornier, you can be transferred to Level Two, where you’ll be assisted by engineers who really know the product. Addressing customer problems and complaints is one of Logitech’s primary ways of gathering information that needs to be incorporated into future firmware updates, so they’re interested in getting things to work right. The Touch’s home screen gives you a choice of basic functions: My Music, Internet Radio, Settings, etc. Select one by tapping it directly on the touchscreen, or by using the right arrow button on the remote. You’re then taken to another menu, where you can make a more specific choice, and then perhaps to a third menu for more options. To return to a previous menu, swipe left or use the remote’s left-arrow button. It’s more complex to describe than it is to do. I found all of the menus to be clear and intuitive -- in a phrase, user-friendly. The touchscreen was very sensitive and easy to use -- I never had to tap a desired function more than once -- and every bit as responsive as my Apple iTouch. Readers who haven’t played music from downloaded files will find the Touch’s controls very much like those of a CD player: Play, Stop, Pause, Chapter Skip forward and back. The Touch has one thing the Squeezebox Classic lacked: fast forward, activated by using a slider bar on the touchscreen. Using fast forward via the remote control hadn’t yet been finalized at the time of writing, but will probably involve holding down the Chapter Skip button. The following comments apply mostly to using the Touch as a device to play files from a computer. All commands can be given by tapping the touchscreen or pressing a key on the remote. The remote control works pretty much as did the one with the original Squeezebox and, also like that remote, has no touchscreen of its own. Some people feel that this was a mistake, and that the touchscreen should have been on the remote rather than on the Touch itself. Whether or not you agree will depend on how far you are from the Touch when using it. My Touch is just to my right on a shelf about 2.5’ away, so it’s easy for me to use the remote to scroll through titles while looking at the Touch’s screen. Moreover, the Touch’s remote has one very useful search feature not on the Touch itself: You can use the numbered keys to display letters of the alphabet, just as you would a telephone keypad. For instance, if you tap 2 (ABC) three times, the program will take you to the beginning of the Cs (a big letter C is displayed on the screen), and you can scan down from there. Or say you want to search something at the end of the Cs: You can click 3 (DEF) once to get to D, then scan up into the Cs. The scan accelerates the longer you hold down the direction button; until you get the hang of it (it won’t take long), you might find yourself zipping by your chosen title. I found this much easier than using my clumsy fingers on the screen itself. In another search function available on the remote, you click in the first two or three letters of the entry you want, but this is slower than getting to the first letter and scrolling up or down. How you can search depends on how you’ve set up your music library. I use iTunes and can search by album title, artist name, genre (particularly handy in December), and year of release. The information for the Touch remote’s commands can easily be loaded into a universal remote control. I’d already set up and configured my Harmony 890 universal remote for the Squeezebox Classic, and was delighted to find that all of those controls worked for the Touch as well. Information can be displayed on the Touch’s screen in different ways. You can choose a background from among nine offered; few will want to keep the default, because letters are hard to read against its background. I settled on Harmony, a combination of purple and dark blue in which words and titles stood out better. If your music files are tagged with the album cover, the Touch will display it while that album is playing. You can choose from among several Now Playing displays: album cover plus text, album cover alone, text alone, a pair of analog VU meters, or a spectrum analyzer. You select the display you prefer in the Settings menu, then tap the screen or click the Now Playing button to cycle them in succession. You can also choose a screen saver that will appear when the player is stopped or playing. But if you sit far away from the Touch when you listen, or are on the move, you’ll probably want to get a different remote. The Touch automatically displays small text when you tap the screen and large text when you use the remote, but if you’re more than 5-6’ away, the screen is not easy to read. In that case, you can either purchase Logitech’s remote controller, or an Apple iTouch (or iPhone) configured with the iPeng app ($9.95). Then you can use all of the amazing features of the iTouch as well. In addition to being a music player, the Touch has many other features, the most important of which is its ability to access Internet Radio. Though you must have your computer on to stream music from it, the radio feature will work whether your computer is on or off. There are hundreds, perhaps thousands of stations from which to choose, and they are well organized by category on the Touch menu. I found that stations varied widely in terms of features. For instance, some would give a readout listing the song currently playing and perhaps the artist as well, but other stations offered nothing more than their own names. You can always get more information on stations, including the broadcast frequency by pressing “+” on the remote and selecting More Information. If you log on to www.mysqueezebox.com (registration required), you can select apps to use with your Touch. Some of these, such as Rhapsody, are pay-as-you-go, but many are free. One of the most interesting, the Live Music Archive, I first discovered while writing about websites that offered HD downloads; here you’ll find hundreds of free legal recordings made by fans at concerts. It’s a voyage of discovery to surf the Archive, which contains performances by many musicians who are not household names. But you’ll find Dave Matthews and the Smashing Pumpkins, as well as the largest collection of Grateful Dead concerts you could imagine. And you can use that SD card slot on the side of the Touch to display slide shows of photos taken with your digital camera. Later, if and when music on SDs becomes commonplace, you’ll be able play those as well. And mustn’t forget -- you can set the Touch to function as an alarm clock, and a rather sophisticated one at that. Squeezebox products are constantly updated through their network connections -- in the three or four weeks I had the Touch hooked up, it received eight or nine updates. I would turn on the Touch, and there’d be a message on the screen telling me an update was available. Then I’d highlight and tap the correct frame to begin the download. Downloading each update took only a few minutes, and then I was ready to go. I welcome such updates; they let me know that I own a piece of equipment that is being kept current, and not being allowed to lapse into an early obsolescence. Every firmware update has caused some function to run a bit more smoothly or opened up possibilities for the future. For instance, a Logitech technician told me that one thing the company is now working on is a deal with Amazon.com that would allow cover art to appear automatically, without the user having to search for it. That and other new features will be made available through automatic firmware updates. And if you’re going to own a Squeezebox Touch, you’d best be prepared to visit Logitech’s forum, either when you need to, or just once in a while to see what’s new. The forum is for customers but is monitored by Logitech’s senior engineers; if you have a problem or suggestion and post it on the forum, you’ll get pertinent comments from an engineer that will help your situation. Many forum members are deeply conversant with computers and constantly tweak their systems, but others simply want to know how to best configure their Touch for their needs. On the forum you can find out about plug-ins that you can add to the Touch to personalize it (there are already several for the clock, and one to make those aforementioned VU meters look sexier). Bottom line: You can be assured that buying a Touch is not a dead-end purchase but an ongoing adventure. Few companies offer such support. My disc player these days is an Oppo BDP-83 universal Blu-ray player. I use a Yamaha RX-V661 receiver as a preamplifier, my main power source being an Outlaw 750 five-channel amplifier. My speakers are all MartinLogan: two Ascents and a Theater in the front, three Aeriuses for the surround channels, and a Descent subwoofer. Because I ran the Yamaha in Pure Direct mode for this review and the Touch supports only stereo recordings, not surround sound, 95% of the time the Ascents ran full-range on their own. With a few recordings, particularly of pipe organ, that included very-low-frequency bass, I found it fun to use Yamaha’s Neural Surround setting, which kicks in the subwoofer and surround channels. Though its 24/96 DAC was the single feature of the Squeezebox Touch that I was most looking forward to, I thought I should first try the Logitech with some Apple Lossless files while I still had good aural memories of how they sounded through the Squeezebox Classic. One recording I know backward and forward is España, with the late, great Ataulfo Argenta conducting the London Symphony Orchestra (CD, Decca Legends 466 378-2). I created both Apple Lossless 16-bit/44.1kHz and AIFF 16-bit/48kHz files from this CD a few years back, and had used Chabrier’s España to test the Squeezebox Classic. It sounded just as splendid via the Touch. The opening pizzicato flourishes had palpable presence and good tone, the cymbals had sheen and sparkle, and the bass was solid as the proverbial rock. Better yet, it had more stereo separation than through the Classic, and better imaging. I often play this recording for guests, but only later do I tell them that it’s a digital file made from a 1957 master tape, just to see their jaws drop in disbelief. Talk about a recording that has stood the test of time! I then ran through a whole group of Apple Lossless files I’d made from CDs at 16/44.1, of all genres, from classical to rock. All passed with flying colors. In general, regardless of genre, they seemed to bear out the promise of the Chabrier: better stereo separation, better imaging, and excellent frequency response. Once in a while one wouldn’t sound quite as good as the rest, but on going back to the original CD I would find that the fault lay there and not with the Touch. More often the file would sound better than the CD: a bit sweeter, and closer to what’s generally thought of as “analog” sound. Curious, but welcome, for a digital device. Then I delved into the 24-bit/48kHz and 24/96 files I’ve downloaded from various sites over the past two years. Almost all of the hi-rez files I have were downloaded in FLAC format, and then, using dBpoweramp, converted to AIFF at 24/48 or 24/96. The Touch will handle FLAC files, but iTunes, where my music library resides, will not, hence the need to convert them. All of the 24/48 files sounded absolutely satisfying through the Touch. The cycles of Alwyn, Bax, and Nielsen symphonies I’d downloaded from the Chandos site at 24/48 had superb transparency with lots of air around the strings, which sounded sweet and pure. With 24/96 files I heard, as expected, sound comparable to what I’ve been hearing for years now from SACD and DVD-Audio discs. The only drawback was that the Touch doesn’t support these recordings’ surround channels. Other than that, the files sounded identical to the two-channel hi-rez tracks on my HD discs. I tried several titles downloaded from www.hdtracks.com. First was Rachmaninoff’s Symphonic Dances, with Eiji Oue conducting the Minnesota Orchestra (24/96 AIFF, Reference/HDtracks). It was completely convincing: sweet, accurate string sound, a wide soundstage, and imaging that gave a breathtaking idea of the depth of that stage. The strings were in front, the woodwinds centered slightly behind them, and the brass and percussion at the rear, even when playing loudly. The overall effect was lush, with excellent definition. I then selected an oldie but a goody, also downloaded from HDtracks: Getz/Gilberto, by Stan Getz and João and Astrud Gilberto (24/96 AIFF, Verve/Universal/HDtracks). The gently scintillating “The Girl from Ipanema” was the monster hit from this album that introduced bossa nova to American listeners back in 1963. For comparison, I’d also downloaded the 16/44.1 CD version as an Apple Lossless file. It was pleasing, but the 24/96 version was more so, with greater stereo separation and superior imaging: each singer or player was placed in a precise location. This gentle music is loaded with expressive nuances, such as lightly struck cymbals and rhythmic yet deliberately subdued piano and guitar, all countered by the crunchy and somewhat demanding sound of Getz’s tenor saxophone. The Rachmaninoff was sampled from a 24/96 master recording, but Getz/Gilberto was, of course, recorded in analog. This is a source of great debate on many audiophile forums: Do analog recordings actually need 24/96 downloads, or is it overkill? My brain said, yes, it’s overkill, but my ears told me that the 24/96 file sure sounded sweeter. To hear more hi-rez recordings that were actually recorded at hi-rez in the first place, I turned to Linn Records. First up was a favorite by jazz singer Ian Shaw, Lifejacket (24/88.2 AIFF, Linn/HDtracks). “Love at First Tequila” features rapid-fire singing over quick-stroke drumming, saxophone obbligato, and occasional supporting vocals, all buoyed by a solid bass line. I could easily hear the individual threads, even as the overall tapestry remained intact. That I could understand every word of Shaw’s quicksilver patter was mostly due to the singer’s artistry, but also to the quality of the recording. I was impressed by the Touch’s reproduction of such complex music. Along those lines, there’s scarcely any music more complex than a Mahler symphony, and Linn offers a 24/96 download of the composer’s Symphony 6 with the Duisberg Symphony Orchestra conducted by Jonathan Darlington (24/96 AIFF, Acousence Classics/HDtracks). (Linn also offers a 24-bit/192kHz version. At this point, the Touch, incapable of playing 24/192, would halve that resolution to 24/96, but the DAC in the Touch is capable of 192kHz -- who knows what future firmware upgrades might bring?) I don’t know which surprised me more: learning that a relatively small city (pop. 500,000) had such a fine-sounding orchestra, or that it had been recorded with such accuracy. In the opening of this gigantic work, the string basses crunched away impressively with their marching beat, aided by a crisp snare drum. As the movement progressed, I was treated to the natural sound of violins, pointed and insistent but never harsh. Golden, burnished brass made the big climaxes thrilling. After hours of listening to music files, I turned to Internet Radio and was again very impressed with the sound of the Touch. I’d not previously heard Internet stations sound so good overall, even via the Squeezebox Classic. Of course, radio stations, like recordings, vary in sound quality, but when I was able to find a good BBC station (be sure to load the BBC applet when offered the choice) or a superb jazz station, the listening experience was of high quality. In sum, the sound from the Touch’s DAC was impressive. 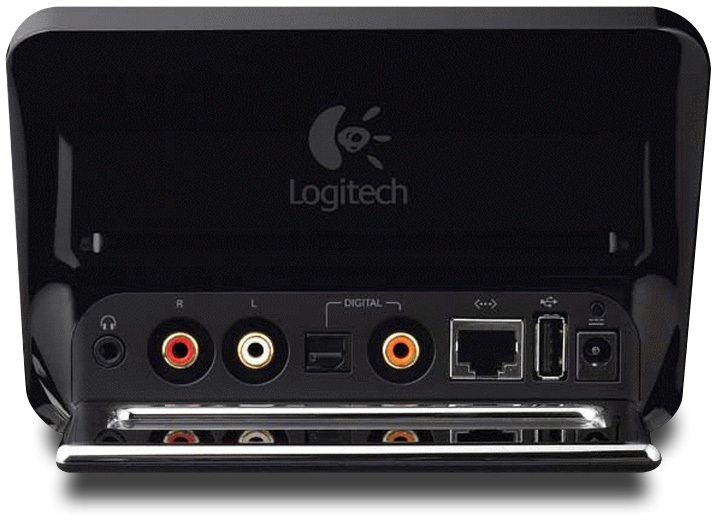 Of course, you can use the Logitech’s digital outputs to plug in an outboard DAC, but unless you’ve spent many times the Touch’s price on your DAC, it’s unlikely to sound much better. The Touch won’t make a horrible recording sound good, but it will make good recordings sound excellent, no matter their bit and sampling rates. 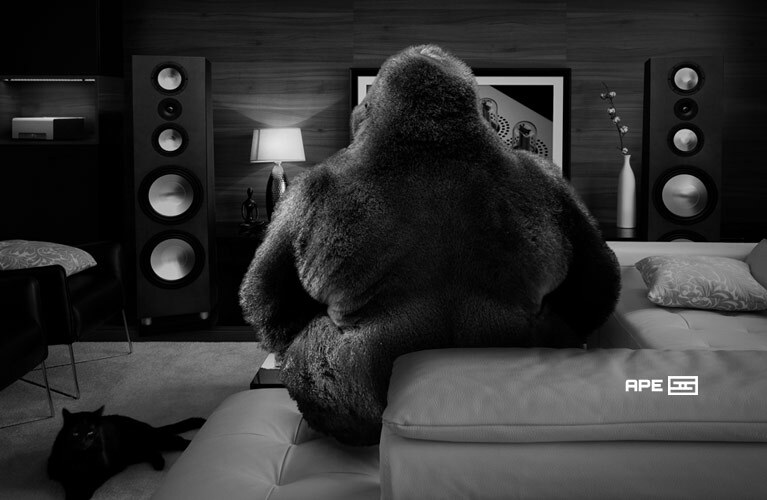 And with an excellent recent recording with HD mastering, it will give you even higher quality. I never felt I was missing anything by not playing the original CD or SACD . . . except for the surround channels. 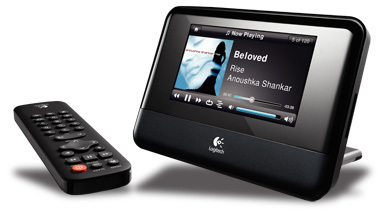 At $299.99, the Logitech Squeezebox Touch is a bargain. It gives audiophile results with high-quality music files, offers superb Internet Radio with a choice of thousands of stations, and has a bright, impressive, responsive touchscreen. Its features and conveniences are sure to delight everyone, and Logitech provides a solid support network that continues to tweak the Touch’s features while adding new ones through firmware upgrades. The Touch makes it easy for anyone to join the growing ranks of those for whom downloads are the main source of music recordings, and solves the problem of not being able to have your audio system and computer in the same room. Some might dislike the remote control’s lack of a display screen, but there are advantages to and solutions for that. The Touch is a superb digital music player, and a remarkable value.